Variations on these intense chocolate no flour cookies pop up all over the internet around Passover, but they deserve some attention all year round as a Gluten Free option. 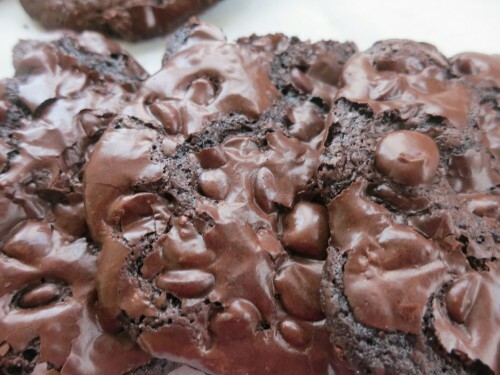 They are deeply chocolaty and take well to experimentation with additional flavors. I like to add some of my favorite chocolate friendly flavors like almond, cinnamon and a hint of coffee. I add coffee flavor in the form of Trablit, a French coffee essence that miraculously has a deep coffee flavor with no bitterness at all. It’s the professional pastry chef’s secret and well worth the money. You’ll find yourself putting it everywhere. But I encourage you to experiment with your favorite flavors. Why use vanilla when you can use a delicious liquor with flavors of orange or blackberry? Use a silpat on baking sheets or line sheets with parchment paper and lightly grease them. Otherwise these cookies can take some patience to pry off the paper. They need to be completely cooled before you touch them. These cookies are easy to make by hand in a bowl with a whisk. Put the following ingredients in a bowl: powdered sugar, cocoa powder, arrowroot, cinnamon, salt and instant espresso if using. Use a whisk and mix until the dry ingredients are well blended and you don’t have any more cocoa or powdered sugar clumps. Add the egg whites and whisk until the batter is well mixed and you no longer see any dry ingredients. Stir in your chosen flavoring and the chocolate chips or chopped chocolate. You might want to use a wooden spoon for this part. The batter will look like thinner brownie batter. Spoon the batter onto the lined baking trays using a small cookie scoop or two spoons. The cookies spread so position the spoonfuls an inch apart. Bake until the cookies are cracking on the surface, about 15 – 20 minutes. Let cool on the trays until you can handle the liner then slice them off onto a rack or cool surface to continue cooking.